On page 66 of this slim novel, a character called Bolaño is quoted as saying: “Tell that stupid Arnold Bennet that all his rules about plot only apply to novels that are copies of other novels.” Perhaps the author inserted this line into the mouth of his eponymous character as a justification for the total lack of plot in Antwerp. This 78-page book is described by the publisher as an early novel by the late Chilean writer Roberto Bolaño, who died in 2003 aged 50, as one that contains in embryonic form all that the would later write. Make no mistake, Bolaño would go on to produce a whole range of excellent works of fiction ranging from the gigantic Savage Detectives and 2666 to shorter novels and short stories—translated into English from Spanish. 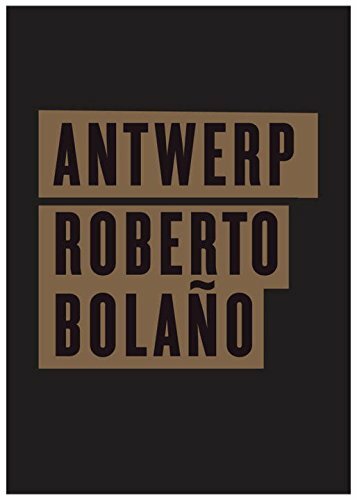 And yes, in Antwerp you can see the gestation of the themes, writing style, and narrative voice that Bolaño would go on to develop, but it is like watching a long distance runner warming up on the track with a few leg stretches and maybe a short jog. Anyone who has heard all the hype about Bolaño but never read him before should not go near this because they will certainly conclude that he is a fraud and wonder what all the fuss is about. However, those who have read Bolaño and become obsessed by him and want to read everything that he ever wrote (and this reviewer counts himself among them) should indulge themselves. The outcast living on the fringes of society who reincarnates in various guises in Bolaño’s more mature fiction can be seen hovering in the shadows. The gnarled, staccato prose that often aspires to poetry is already fully formed. But Antwerp’s 56 “chapters”—never running to more than two pages, and sometimes filling just half a page—are really just a series of vignettes with a very loose detective/murder theme running through them. Most writers will have something similar tucked away in an envelope: the sketches and outlines of a first novel that got sidelined by more structured and fully realized works. Most of those fragmentary first stirrings will never be published unless their authors also become publishing sensations with a readership hungry for more. It is presumably that audience at whom this stylishly bound little volume is aimed.